Welcome. This cable section is for control cables, that slide back and forth, not speedometer cables, that rotate. For speedometer cables, see Parts/Frame/Speedometer. Single or Double Ended: Some control cable inner wires have two ends, and some have only one. 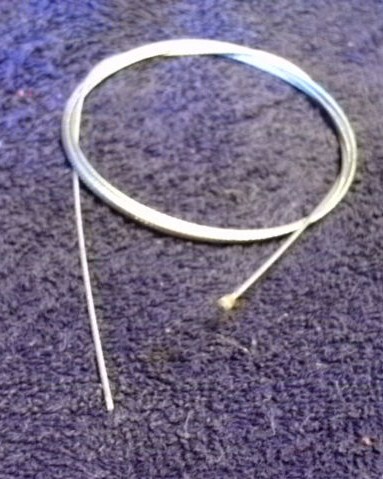 The “end” is a round piece if metal, usually soldered onto the braided steel wire. When a cable inner wire has only one end, it can be removed from the conduit (or sleeve or housing). When a cable inner wire has a ball of lead at both ends, then it is permanently trapped and cannot be removed without cutting one end off. Lubing Cables: Old cables become sticky from deteriorated oil and corrosion. 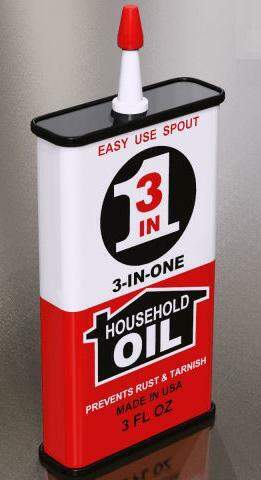 A few drops of fresh thin oil is often all the cable needs to work good again, after a long period of sitting. Apply a few drops of oil or synthetic lubricant (preferably Tri Flow) onto the upper exposed inner wire so that it runs downhill into the cable. The bike is leaned over so that cable entrance is going down. The oil takes a few minutes to flow down the wire. Straighten out any kinks in the cable. Also lube the throttle, especially sliding block kinds, and the levers, where the lever pivots, and where the cable pivots. 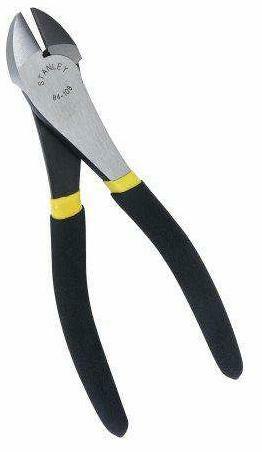 Cutting cables: The preferred tool is called a diagonal cutting pliers. It must be fairly new and sharp to cut braided steel cable inner wires and coiled steel cable outer conduits. Most of the inexpensive kinds do not stay sharp long. Configuring cables: A single ended “universal” cable is configured, or made into, a double ended “specific” cable. Any cutting of the sleeve, adding stop pieces, adapters or adjusters is done first. Then the cable is installed on the bike. Lastly, the top end piece is installed in the correct location on the wire. 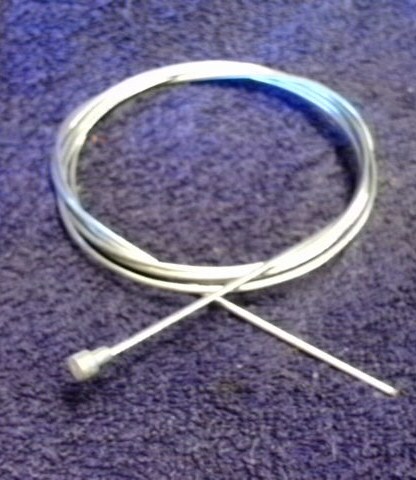 The wire strands are bent into an umbrella, and soldered. This is often necessary when ready-made cables are not available. 1978-83 AMF Roadmaster mopeds have special brake cables. All models, 110, 115, 120, 125, 130, 140, 141 have the same controls and hand brake levers. At the upper end the black plastic hand lever is a unique American design that requires a special cable end. The original end piece looks like a “T” but the replacement is just the top part of the “T”, made from a Ø3.9 x 7.2 mm brass cable end E5f, ground shorter to Ø3.9 x 5.9 mm. On all models the lower end of the cable has no soldered-on cable end. The cable is the same but the piece that attaches it to the brake arm has two types. 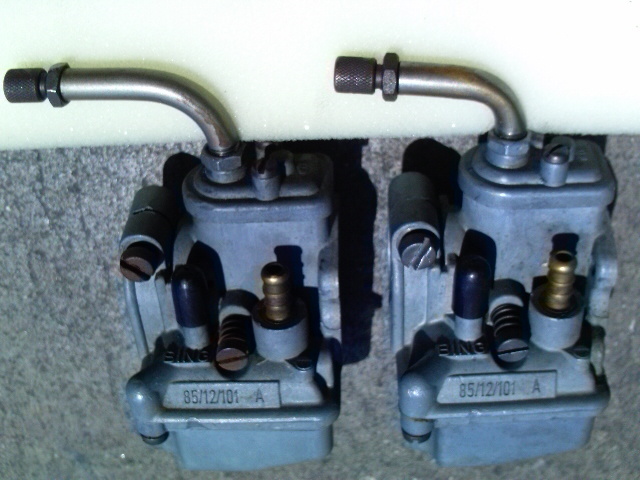 Models 110 and 115 have Hercules-Sachs type special clevis clamps (right in photo) on both front and rear. Models 120, 125, 130, 140, 141 have clevis clamp on front, and Grimeca pinch bolt (left in photo) on rear. 1970’s Batavus mopeds use 1970’s Magura controls. 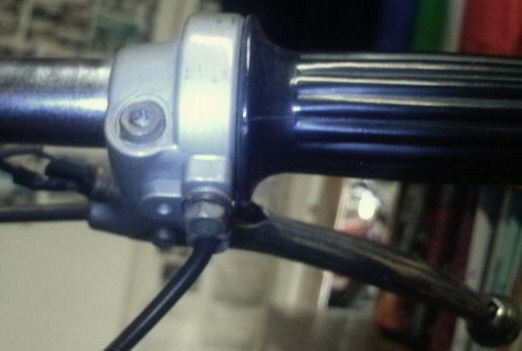 The left side is the rear brake and start lever. The right side is the front brake, throttle, and choke trigger. 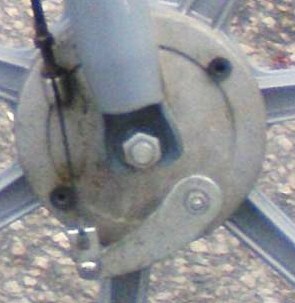 The brake cables connect to the levers with little adaptor pieces called socket bolts or cable anchors. M48 engine, bottom carb 33.5 x 37.2"
41-407 $15 57.5 x 60.8"
substitute $20 38.6 x 41.3"
substitute $23 35.5 x 44"
substitute $10 38.8 x 40.1"
M48 engine, bottom carb 37.0 x 40.7"
41-250 $20 61.0 x 64.3"
substitute $20 41.6 x 44.3"
substitute $10 41.8 x 43.1"
M56 engine, side carb same as above same as above 38.5 x 41.2"
Trac 84565 $19 same as above 41 x 42.5"
M56 engine, side carb 37.0 x 40.1"
substitute $24 61.0 x 64.1"
Note: 1976-77 Batavus Bronco has same cables as VA, but all are 10″ longer, because it has “ape hangars”. 41-248 and 41-405: These are very long throttle cables, for a moped, because the carburetor is below and behind the motor. They have a short Magura adjuster on top. Substitute: The substitute cable has a different style of Magura adjuster at the top end. 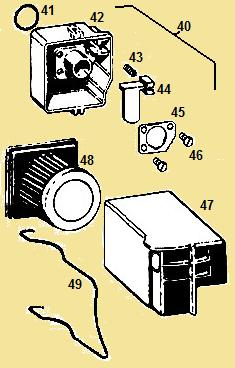 41-246 and 41-406: There is no adjuster on the choke cable. Instead there is a rubber boot (not shown) that keeps water and dirt from getting in. 41-247 and 41-409: These start cables are single ended, where the wire slides out, so the 5-8 step ferrule, and the Magura short adjuster are shown and sold separately. The upper inner wire end is held with a pinch bolt built into the black plastic Magura start lever. The adjuster is optional, since it is easy to adjust from the pinch screw. 41-250 and 41-407: These front brake cables have a 6mm 10-hex type adjuster on the bottom end, and a short Magura type adjuster on the top. The second adjuster on top is a convenience, so you can adjust it while riding. Substitute: The substitute cable has no Magura adjuster at the top end. 41-249 and 41-408: These rear brake cables have a 6mm 10-hex type adjuster on the bottom end, and a short Magura type adjuster on the top. The second adjuster on top is a convenience, so you can adjust it while riding. 41-397 and 41-398: These brake cables for mag wheel models have a “Ø6 pear” or “mushroom” on both ends, a 6mm 10-hex type bottom adjuster, and a short Magura type top adjuster. The top adjuster is a convenience, so you can adjust it while riding. Substitute: The substitute cable has no Magura adjuster. It has a similar but generic 6mm adjuster on the bottom end, at the wheel. 41-434: It has a short Magura type adjuster on top. 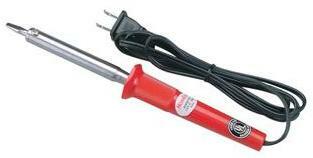 Substitute: The 1981-84 Trac throttle cable is the substitute. It has a slightly different style of Magura adjuster. 41-286: This is a single ended cable. First the inner wire slides though a small brass choke plunger. Then a set screw holds it from the bottom end. Two tiny rubber o-rings go into grooves in the choke plunger. 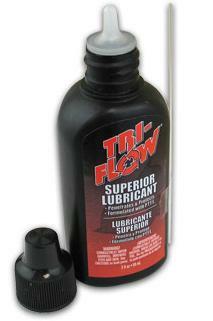 See Encarwi carburetors for that. At the top end, a 5 x 7mm pinch bolt, shown and sold separately, goes into a plastic thumb trigger in the right control. 1976 and some 1977 Cimatti had Domino wrap-around type throttles and double ended throttle cables. Early type double ended cable: For the original double ended throttle cable to fit, the curved pipe aka carb elbow must be the one that is 22mm tall and 30mm long, at the far left. 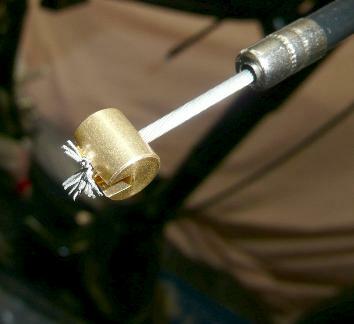 If a different carb elbow is used, then the cable must be cut and re-soldered to match. 5mm Adjusters: Wonder why a Cimatti early double ended throttle cable does not have the 5mm adjuster trapped onto the cable, but a Puch double ended throttle cable does? It is because the center hole is over 3mm on the Italian Dellorto M5-0.75 thread adjuster, but under 3mm on the German Bing M5-0.80 thread adjuster. So the 3mm diameter carb end passes through on Dellorto, but not on Bing. 1978 and later, and some 1977 Cimatti had Domino slide type throttles that used single ended throttle cables. The cable runs parallel to the handlebar. Later type single ended cable: Most Cimatti are this later type. It does not care what carb or what elbow is on the other end. During installation the (usually new) wire is pulled almost taut, so any excess slack is removed. After the pinch bolt in the sliding block is tightened, the excess wire “tail” is cut off. Columbia Commuter mopeds and their alias names had two different frames, stamped sheet metal, or mono-tube, and two different engines, Sachs 505 or Solo. All Columbia models had front and rear hand brakes, with 1970’s Magura controls. 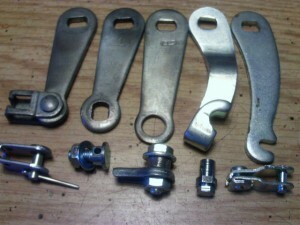 The early 1977-78 sheet metal frame models with Sachs 505 engine, had single-ended (universal) brake cable wires, with Grimeca type pinch bolts on the lower end. But the tube frame models and the late 1979-on sheet frame models had special brake cable ends, shaped like an “S”. Solo engine Columbia: On Colombia with Solo engine, the throttle cable carburetor end passes through the a M6-0.75 thread adjuster on the top of the carburetor. 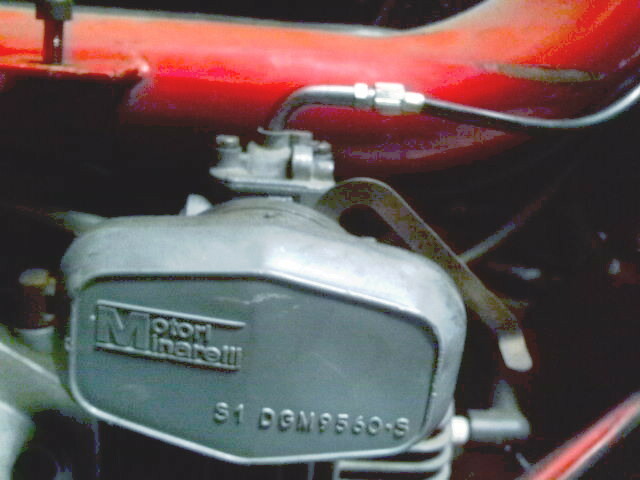 So the adjuster is not part of the cable, unlike Puch, and like on the Colombia with Sachs engine. 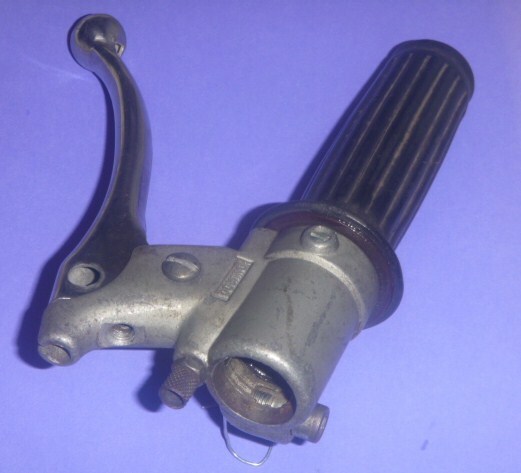 Sachs engine Columbia: On Columbia with Sachs engine, the throttle cable carburetor end passes through a M6-0.75 thread adjuster on the Bing carb elbow, so the adjuster is not trapped on the cable, and is sold separately. 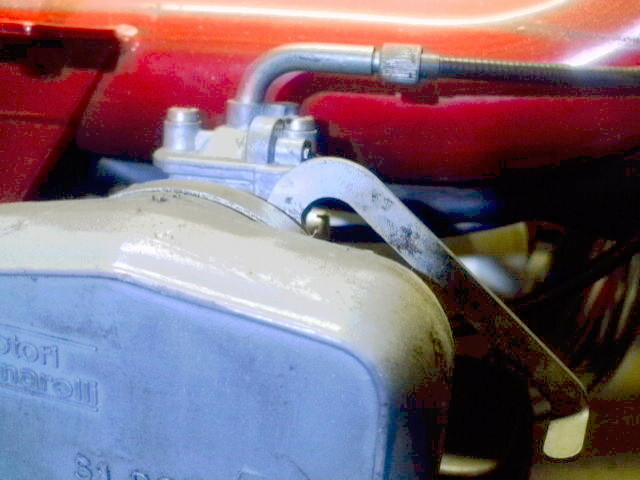 The carb elbow, aka curved pipe, can be either short or long. 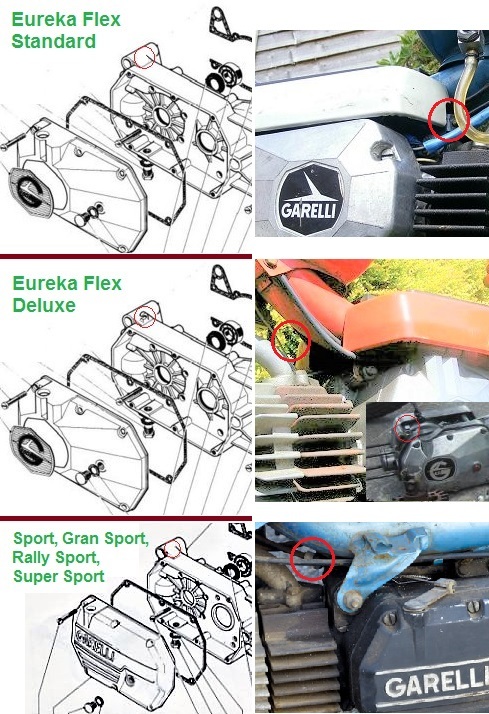 So there are two different throttle cables, short or long. The difference is 1/2 inch of exposed inner wire. This exposed length of 4.5 inches is for a “short” elbow. Removed, the short elbow total length is 2 inch with the adjuster, or 1 1/2″ without, measured with a curved wire through the middle. There are some Colombia’s with “long” carb elbows. They need this cable with a 0.5″ longer exposed length. The long elbow, removed, has a total length of 2 1/2″ with the adjuster, or 2″ without. See Hercules Sachs choke cable for info. Things that are shown removed from the cable are not included with the cable. Things that are shown installed in the cable are included with the cable. So on the first cable below, the step ferrule is part of the cable, but the adjuster and clamp bolt are not. This sharp-bend U-turn shorter cable performed poorly. The wide U-turn, longer cable was better, and superseded it. 12 Garelli replacement start cables are offered: 3 lengths H,G or V, 2 styles d or e, 2 thicknesses 1.5 or 2.0. Length is the same as original. For shorter or taller handlebars, the cable length would be shorter or longer. Thickness is the same as original. (in mm) wire 1.5, conduit 5. HD cables are thicker, wire 2.0, conduit 6. Why so many? 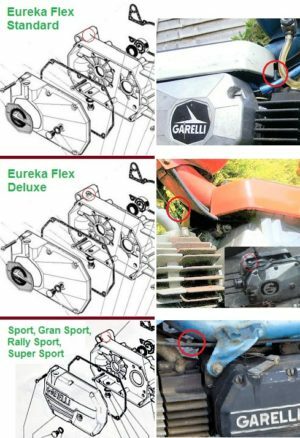 1) Garelli mopeds have different engines. 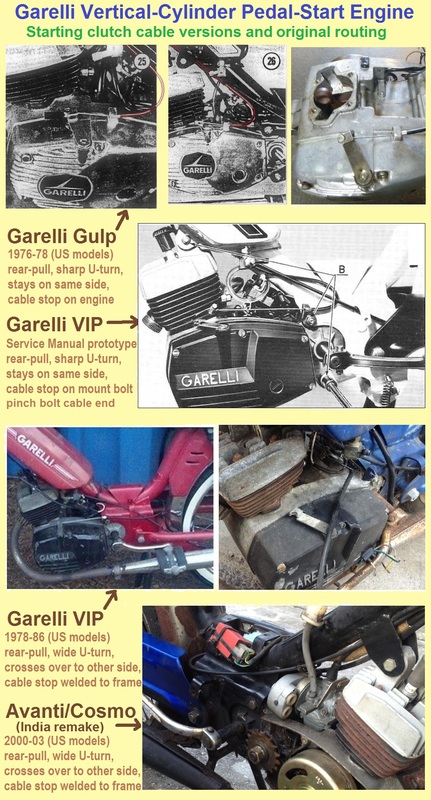 The type of Garelli engine Horizontal, Gulp, or VIP, and the cable routing, determines the cable length. See above photos of original cable routing. 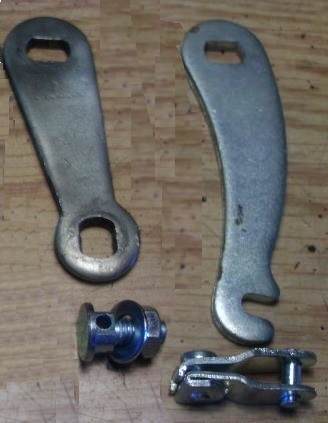 2) Garelli mopeds can have 2 different hand lever cable end pieces. 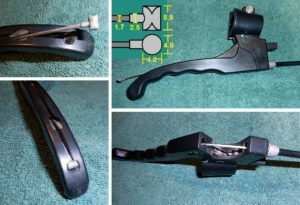 The type of end piece in the hand lever (adapter “d” or clamp “e“) determines the style of cable inner wire end (mushroom or sideways barrel). 3) Standard “std” 1.5 mm, or heavy duty “HD” 2.0 mm thicknesses are offered. The thickness is a matter of choice. Why heavy duty? Often the starter mechanism inside the engine gets worn, glazed or messed up, causing the starting clutch to slip. Then the start lever has to be squeezed real hard. A thicker cable performs better when the lever is squeezed really hard. The thicker HD cables are for Garelli mopeds that slip when starting. These “H” start cables are front-pull. So they are the shortest. See horizontal engine start cable photos above. The replacement cable bare is just the wire and the conduit-with-end-caps. The pieces a, b, c, d, e are sold separately. They slide off or detach from the single-ended cable. See below. These “G” start cables are rear pull. So they are longer than “H”. They do a quick sharp U-turn, and stay on the same side of the frame. So they are not as long as the “V” type. These “V” cables are rear-pull. They are the longest, because they go to the rear first, then make a wide U-turn behind the engine to the other side of the frame. Garelli start-clutch cables have been a difficult subject at Myrons Mopeds for many years. Not only are there different cables, engines and routings, but the bikes can have different end pieces, clamp “e” or adapter “d”. Those things can be changed, so the customer has to say what kind the bike has. To make matters worse, the clamp “e” has been scarce and unavailable since the 1980’s. So there is a lot of explaining to do. And then, there is a tendency for the start cable to wear out or break, because the starting clutch mechanism inside the engine slips, which requires the cable to be pulled very hard. Domino Socket Bolts: 1970’s Italian moped brake levers and start lever use these adapter pieces to convert the pear end to a longer sideways barrel. 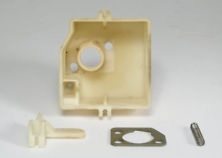 They are more than just an adapter, because they have a slot for the inner wire to pass through, to allow installation. There are two lengths, 16mm for brake levers, and 14mm for decomp/start levers. It is important to have the cable wire centered in the lever. So there is a groove that the sheet metal lever sits in when the lever is squeezed. That groove keeps the socket bolt from sliding sideways. Without that groove, the cable still functions, but maybe not as well, or it might make a “click” sound and feel, when it does not stay centered. A longer one will substitute for a short one, with a 8mm washer under it. But the washer covers the centering groove, so it might not perform as well as an original. Hercules mopeds are commonly known as Sachs in the USA. We use the true maker name to avoid confusion with Sachs engines, which are used on non-Sachs bikes, like Sparta, General, KTM, and also to include the alias brand names Eagle, Pegasus, etc, made by Hercules. Early Hercules cables were all single ended, in the tradition of bicycles. The brake cables had clevis type pinch bolt ends, type 5 at the right. The clevis piece and adjuster are sold separately. Later Hercules had double ended brake cables, in the tradition of motorcycles. They attached easily and securely to a clevis piece that was riveted to the lever arm. This made it safer and more fool proof, but also made the brake cables specific and difficult to get or make. The early controls (not shown), here nicknamed “Early 1970’s Magura” had bottomless threaded holes, requiring standard M6-1.0 adjusters. After 1976-77 they had the “1970’s Magura” controls. The brake cable end holes changed from threaded bottomless to slotted with bottom, to accept either a plain cable or, optionally, a Magura type adjuster. The Sachs external choke is part of the air filter box, front half. The Ø3 end goes in the plastic slide. The upper bare end requires a 5×7 pinch bolt for the right thumb lever. The design requires that the upper end of the cable be removed to install or remove the cable. (If there was a double ended Sachs choke cable it would require a Magura type adjuster to be adjusted way up/tighter to allow for installation slack). Since this is a single ended cable, it does not matter if the carb elbow is long or short. The pinch bolt can be located accordingly. All original Hercules cables had light grey plastic oil ports, located a few inches from the top end. Replacement cables do not have oil ports. You are currently browsing the archives for the Cables category.